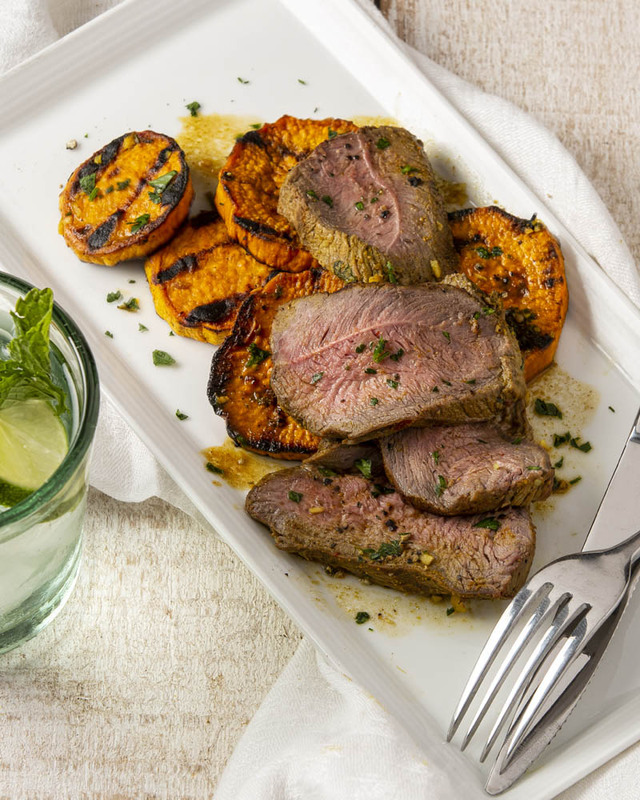 Give the basic barbecue a twist with this curry-infused combination of California lamb and California sweetpotatoes. A simple marinade—made with coconut milk, lime, ginger, and curry powder—takes the always-amazing duo from good to great. Cut any large layers of fat from the lamb, then cut the lamb into 4 pieces and set aside. In a large resealable bag, combine the coconut milk, onion, cilantro, lime juice, curry powder, ginger, salt, red pepper, and garlic. Remove 1/2 cup of the mixture and set aside. Add the lamb to the bag and turn several times to coat the meat. Seal the bag, squeezing out as much air as possible, and refrigerate for at least 8 hours or as long as overnight. Preheat a grill to medium and well-oil the grate. Remove the lamb from the marinade (discard the marinade) and grill until nicely charred and cooked to your desired doneness, 5 to 7 minutes per side. While the lamb is grilling, in a medium bowl, combine the sweet potatoes and reserved marinade, tossing until the sweetpotatoes are well coated. Grill until tender, 3 to 4 minutes per side. Sprinkle with salt and black pepper to taste. Arrange the sweetpotatoes on plates or a platter. Thinly slice the lamb and arrange on top. Garnish with cilantro and serve.